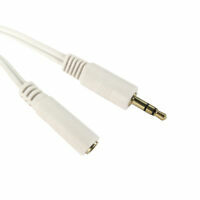 This stereo audio extension cable from Kenable can be used with countless devices as an input or output extension lead. It's a three-metre length of cable, terminated by a male 3.5mm (1/8") jack plug at one end, and a female 3.5mm jack at the other. 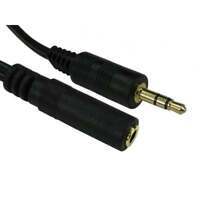 With gold-plated contacts for superior conduction, it's commonly used for extending headphone cables, and for line-in connections to-and-from music players and recorders. I have a wall mounted TV, therefore I had a hidden wiring job to do involving using a small hole drilled through a wall, shared by another cable. Because of the slim design of the plug I was able to pass this cable through as well! This then allowed the transmitter for the TV's head phones to be hidden with no drop in sound quality. Unfortunately the female connector is not very secure. The mail socket on my headphones works perfectly when connected to other equipment. I have to occasionally twiddle with the connector to get it working properly. I do still use them and with slight annoyance they do the job, but sorry would not recommend. Good quality lead, looks just like the picture, much cheaper than on the high street (if you can even find one!) and free postage too. Delivered in two days. A total no-brainer. Value purchase that does the job. Used to connect headphones to TV. The cord is light but seems quite tough. Both male and female socket seem sturdy and fit well. No downsides to report. Its a value price for a decent product. 3m 3.5mm Jack Extension Cable Lead. Excellent product that works well and is good value for the money.